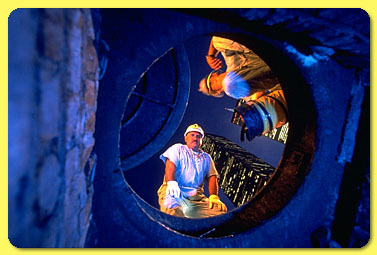 NYNEX technicians peer into the depths of a three-story-deep manhole. Under their feet, 208,00 telephone lines snake into the looming World Trade Center. "It's a puzzle," observes Eddie Melendez, at the bottom of the shaft. Approximately 465,000 manholes have been bored into New York City streets, passages between the surface and the roots of the city.